​Negativity is toxic. And, like most things of a toxic nature, it is also highly contagious, especially when situated in its perfect breeding ground - an online platform where anonymity and aggravation are rife. But, for just the second time this season (the first being the 3-0 trouncing by Spurs), this negativity in the Blues' 'twitterverse' was warranted. Because the 2-0 defeat to Arsenal at the Emirates displayed all the visitors' frailties in one fell swoop. The silky possession that becomes stilted when the players realise there's no end game to it without a focal point. A subsequent inability to hit the ball towards the net, let alone into it. Insufficient pressing. No real desire. No backs-to-the-wall resistance. Nothing much of note at all, really. And, yes, much of these problems lie at the feet of Maurizio Sarri. He is the commander in chief. It was he who thrust ​Eden Hazard into his ill-favoured false nine role. It was he who left Olivier Giroud festering on the bench until it was too late on Saturday. It is he who has maintained his rigid grip on the 4-3-3 formation, persisting with ​N'Golo Kante in an ADVANCED POSITION (!? !#$*&^@#) and the (since Tottenham) compromised Jorginho as the anchor. He is still using Cesar Azpilicueta and Marcos Alonso as full backs rather than a centre back and a wing back, and he's still icing out Ethan Ampadu. Oh, and the entire mentality within the club is completely shot. Is that everything? Probably not. He also smokes and shouts at his players after bad results. I hate that guy. Why don't we just sack another manager after six months in charge, to further damage our fading identity, and plunge the club's transfer business and squad building into further crisis. YeAh!! SaRrI oUt!!! But wait. There's far more to it than that, and still plenty of reasons to rejoice instead of wallowing in this embarrassing, misplaced despair. For a start, Hazard hasn't even looked that good recently anyway, so it won't matter when he - wait, not helping? Ok, ok, sorry. Seriously, though, it's not the end of the world. Just as the 3-0 loss at the Emirates in September 2016 divided the season into a pre and post 3-4-3 world, the latest defeat may well separate the season into pre and post-​Gonzalo Higuain life. Though the addition of a 31-year-old striker in the place of a 26-year-old one may not seem like progress, trust me it is. Because that 26-year-old was Alvaro Morata. Need I say more? As alluded to, many fans (again, on the most reliable of barometers for opinion) have railed against the 60-year-old tactician for his obstinate use of a diminutive front three. But this has been enforced on him by Morata's confidence deficiencies and Giroud's...Giroudness? In Higuain, the manager finally has the striker he wanted all along - the man who he sculpted (renaissance style) into a record breaking goalscoring phenomenon. Now, the evident mentality issues that have intermittently plagued the club since Jose Mourinho's first sacking clearly cut far deeper than any scoring problems that may persist now. But, that doesn't necessarily mean that they can't be healed, at least temporarily (it always is temporary at ​Chelsea), by one proverbial stone. 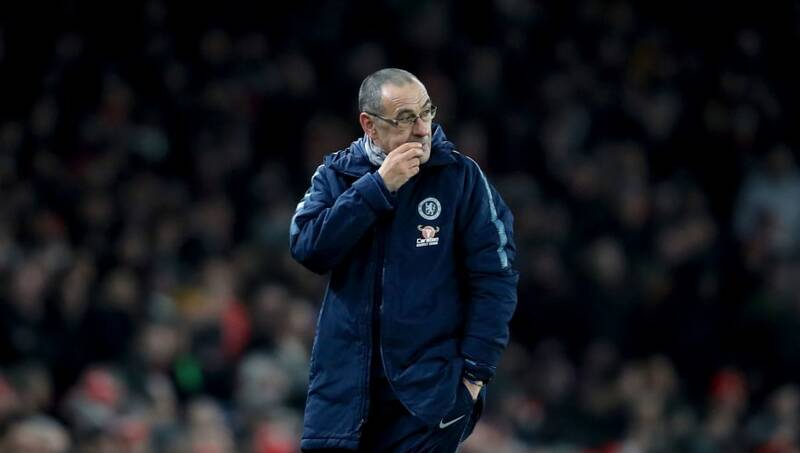 The fickle nature of this squad has been proved countless times over, but maybe this trait could play into Sarri's hands should Higuian hit the ground running. Their mentality has been rehabilitated in the past by new tacticians, so why not a new, and undoubtedly even more necessary, world class striker? Yes, that's right. World. Class. If this WORLD CLASS striker is not a success, then I will personally foot his mate tea bill for the entire time he's in London. I'll even chuck in a three-course meal at a venue of his choice. The point is, all is not lost. The Blues are still three points ahead of Arsenal, and four points behind a rudderless Tottenham. They're still in the EFL Cup semi final, and have a great chance of making it to the final on account of the aforementioned war-torn nature of Spurs' side. One slightly pass-heavy and passive loss to Arsenal isn't the end of the world. Keep calm, think of the 6-0 win over them on Arsene Wenger's 1000th game in charge, think of Gonzalo #HiguaIN's goal against Atalanta this season, and carry on.